For years, the Concord Pacific lands have been used as a parking lot and space for special events, including the occasional Cirque du Soleil show, staging area for the Molson Indy, and exhibition pavilions during the 2010 Olympics. 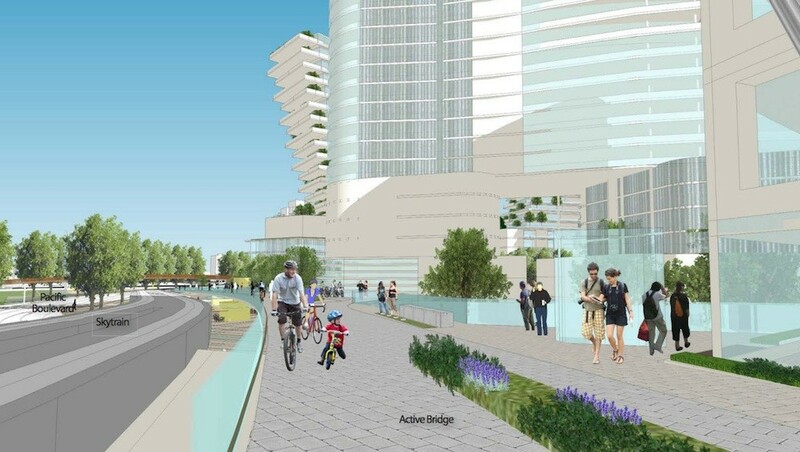 But permanent plans for this area, Northeast False Creek, are now becoming clearer now that the City of Vancouver has set in motion its controversial vision of tearing down the viaducts. 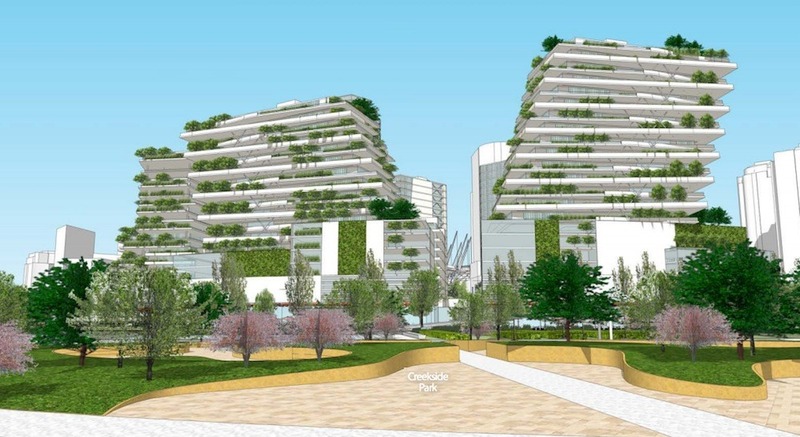 Conceptual plans for Canadian Metropolitan Properties’ Plaza of Nations redevelopment, PavCo’s new mixed-use tower at BC Place Stadium, and the municipal government’s 11-acre Creekside Park expansion were revealed earlier this month. 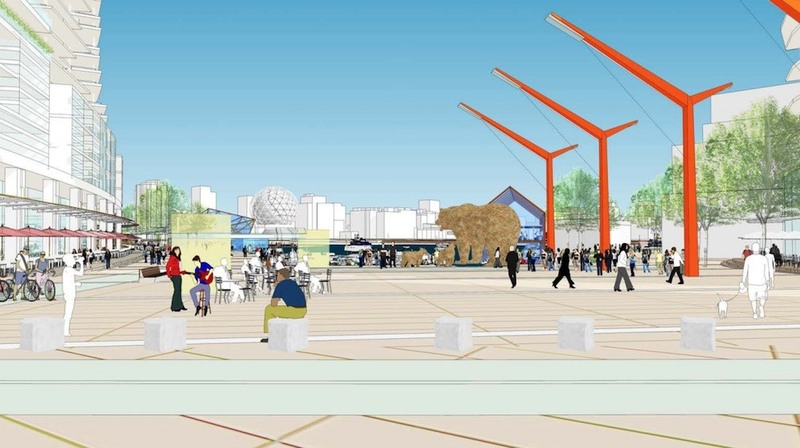 And now, Concord Pacific’s preliminary plans for its 10.2-acre waterfront site, between the new park and Plaza of Nations redevelopment, are also public. 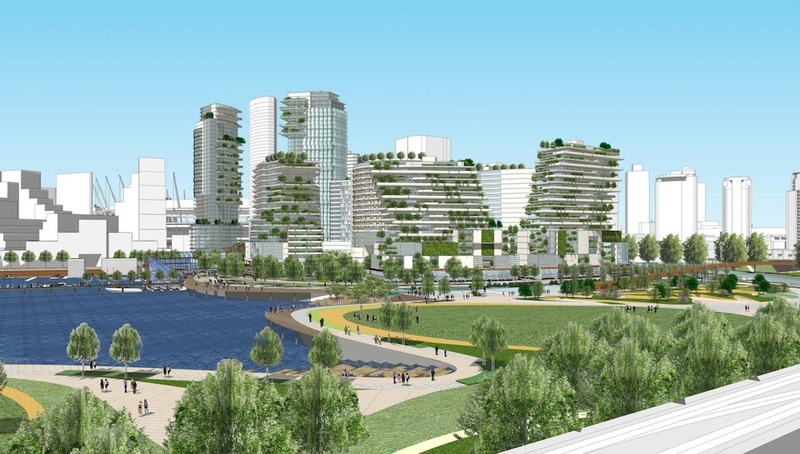 The Vancouver-based developer has submitted a concept plan designed by local firms DIALOG and CIVITAS to the municipality that aligns with the City’s overall vision of turning Northeast False Creek into an events and entertainment district, with restaurants, bars, and retail on the lower levels and residential on the upper levels. There will be approximately seven water-facing restaurants ranging from 4,000 square feet to 6,000 square feet each in addition to larger signature restaurants. A new seawall and wharf area, with steps that gradually bring people close to the water, fronted by ground-floor restaurants and bars and even floating restaurants and pavilions have been conceptualized. 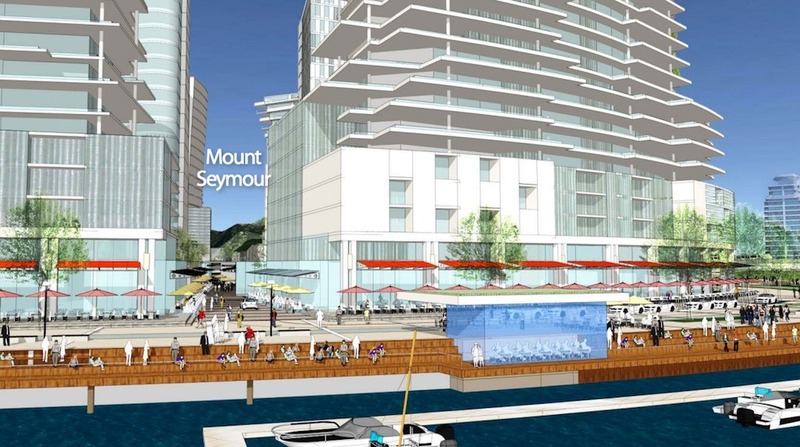 Next to one of the floating restaurants, the plan includes a publicly-accessible pier jutting out into False Creek with a possible new additional dragonboat facility. At the intersection of Pacific Boulevard and the future West Georgia Street extension, a large public plaza, aptly named Georgia Plaza, is planned as a gathering and event space that links BC Place, Rogers Arena, and the waterfront together. A network of three pedestrian-only laneways that splice through the area will be lined with restaurants, cafes, pubs, and retail, including a 16,000-square-foot grocery store and 8,000-square-foot drug store. 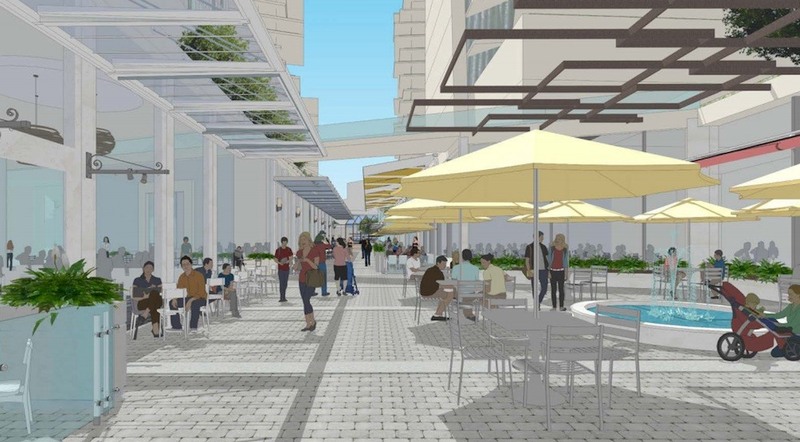 Altogether, Concord’s entire mixed-use redevelopment could have a floor area of up to 2.8 million square feet, including 230,000 square feet of restaurant and retail space and 45,000 square feet of office space. 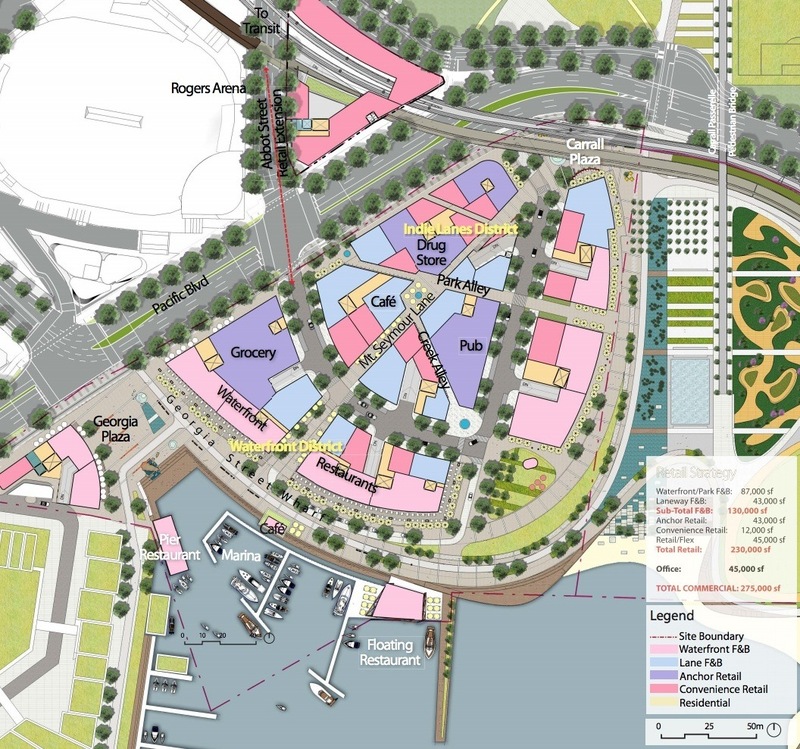 The remaining space will be largely residential – a mix of market and social housing – for about 6,000 people. 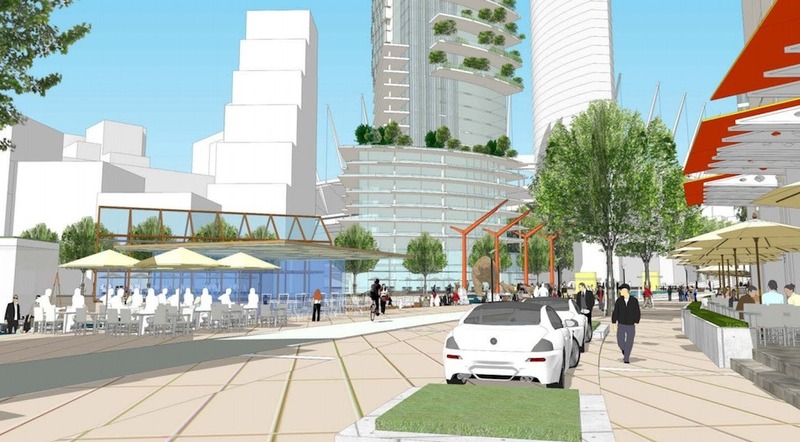 The tallest towers – two towers at 41 storeys, up to 425 feet in height – will be located at the intersection of Pacific Boulevard and the future West Georgia Street extension. 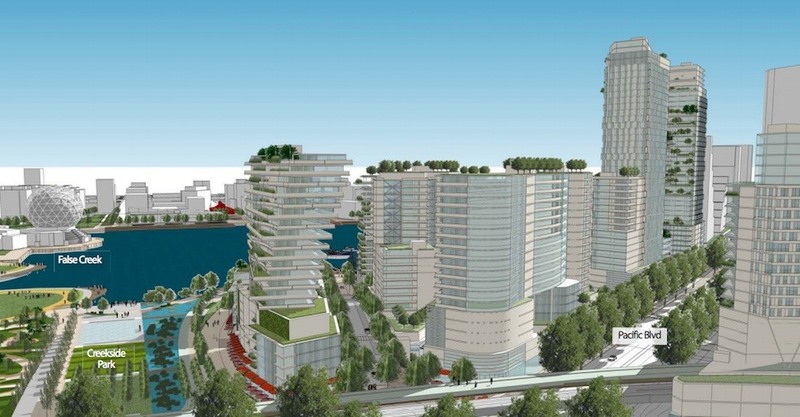 Both towers and the proposed BC Place tower will frame the new Georgia Plaza. 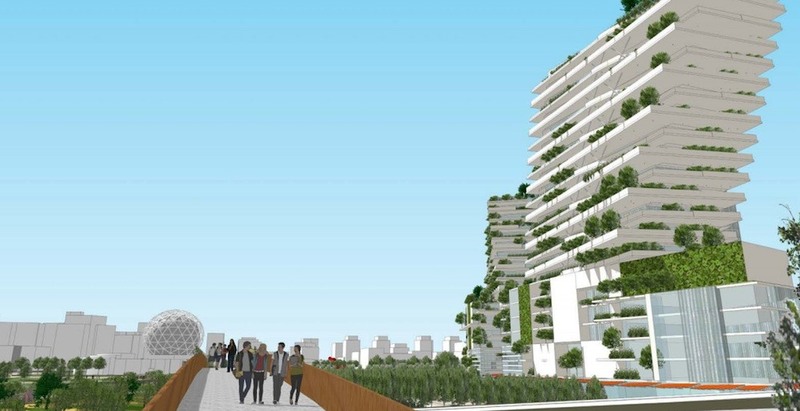 But to achieve the creation of this landmark focal point, planners with the municipal government are proposing that the height of the towers should exceed the current limits stipulated by the view cones, which is set at 300 feet for the area. 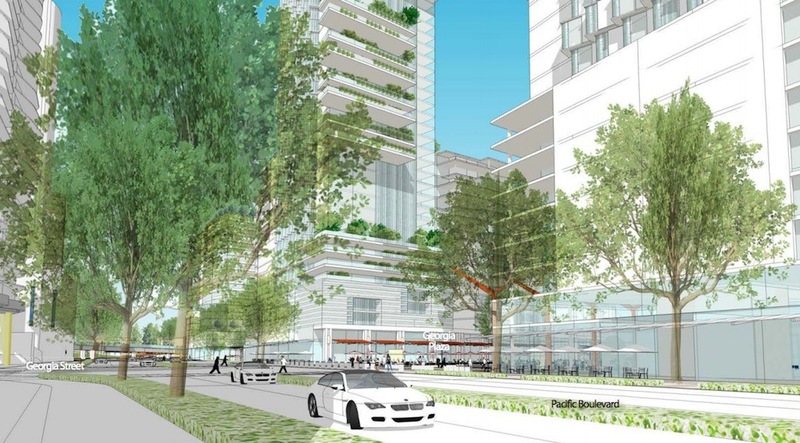 Most of Concord’s proposed towers for this project are approximately 20 storeys tall. 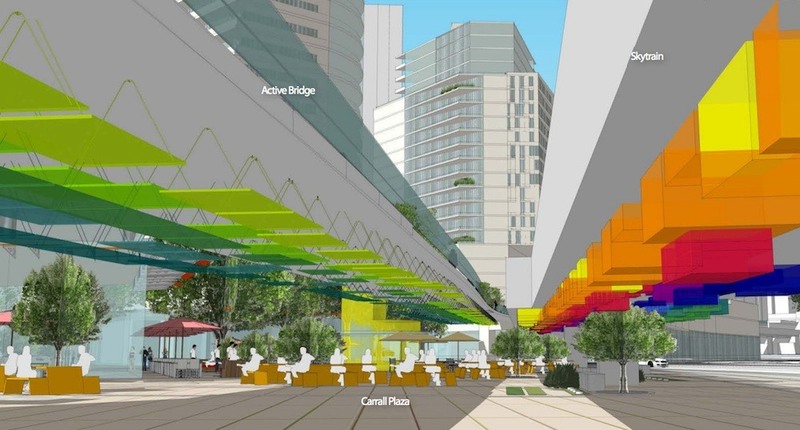 Artistic renderings in the early concept proposal show major aesthetic enhancements to the elevated SkyTrain guideway that frames the Concord site on the north along the new Pacific Boulevard. 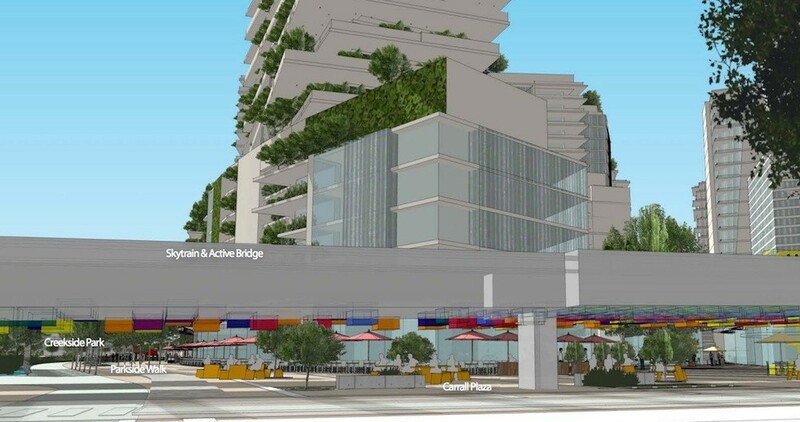 Similar public realm-oriented designs are also planned for the adjacent new pedestrian and cycling-only bridge that starts from Dunsmuir Street next to Rogers Arena and ends at the new park extension. 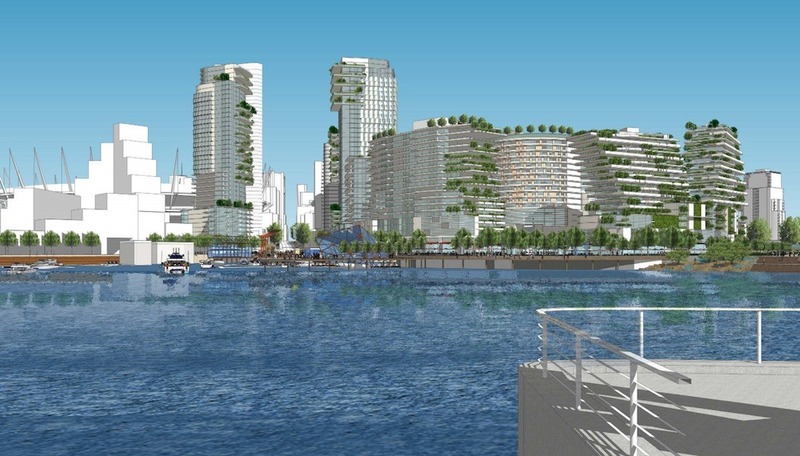 Project proponents say the design takes inspiration from: the harbour at Portofino, Italy; Waterfront Quay and Aker Brygge Stranden in Oslo, Norway; High Line Park in New York City; Cockle Bay in Sydney; Copacabana Beach in Rio de Janeiro; and the laneways of Melbourne, Australia. 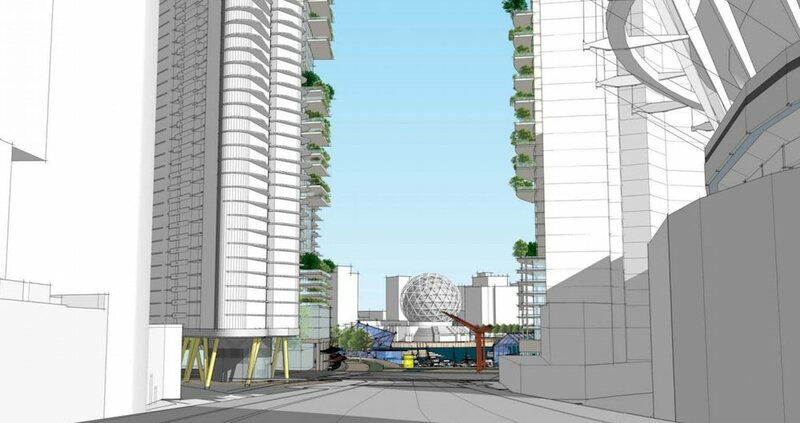 Vancouver City Council is set to consider the Northeast False Creek draft area plan and finalize the removal of the viaducts this fall.